A tube made in inconel (conductivity of 1 MS.m-1 and a relative permeability of 1) is inspected with a rotating probe. The tube has an external diameter of 18.99 mm, an internal radius of 8.32 mm, a thickness of 1.175 mm and measures 50 mm length. 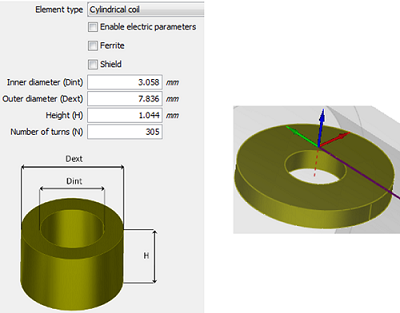 The probe is a cylindrical coil which geometrical characteristics are defined on the following figure. The acquisition is carried out in an absolute mode at 5 different frequencies: 25, 50, 100, 150 and 200 kHz. Geometrical characteristics of the probe, here defined in the CIVA panel. The tube contains a longitudinal through wall notch of 12.2 mm length notch, with the same thickness as the tube, ie 1.175 mm, and with an angular extension of 0.585°. Lissajous curves are drawn and the amplitudes, phases, real and imaginary parts as a function of the scanning are represented on the figures below for the frequencies 25, 50, 100, 150 et 200 kHz . A good agreement between experiment and simulation is observed. 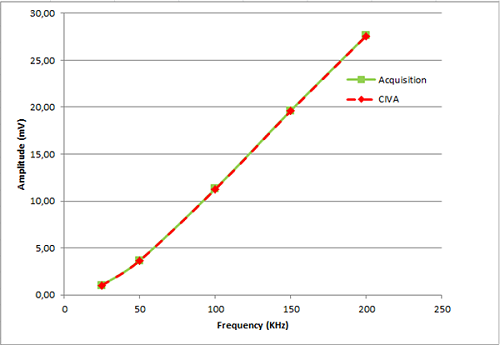 Then, the amplitude and phase values are gathered in a table and the difference between acquisitions and CIVA simulations are calculated. The small differences confirm the good agreement between CIVA and experiments. 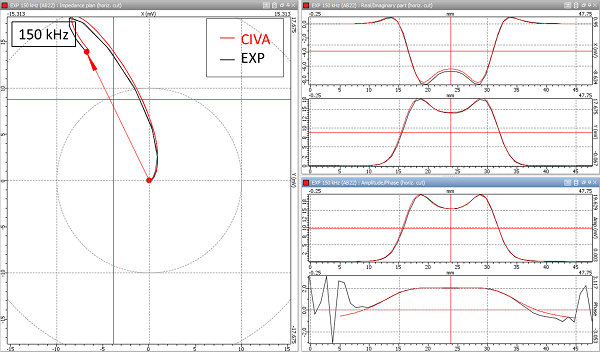 CIVA/Experiment comparison at 25 KHz. Left handside: Lissajous curve, right handside from the top to the bottom: real part, imaginary part, amplitude and phase. 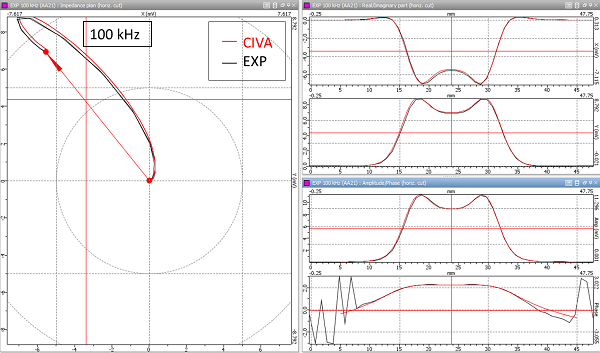 CIVA/Experiment comparison tabel of amplitude and phase values at 25 kHz. CIVA/Experiment comparison at 50 KHz. Left handside: Lissajous curve, right handside from the top to the bottom: real part, imaginary part, amplitude and phase. 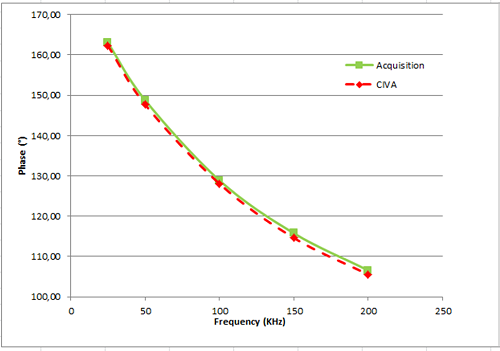 CIVA/Experiment comparison tabel of amplitude and phase values at 50 kHz. CIVA/Experiment comparison at 100 KHz. Left handside: Lissajous curve, right handside from the top to the bottom: real part, imaginary part, amplitude and phase. 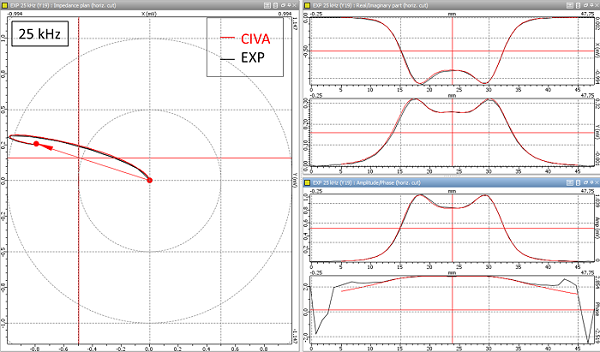 CIVA/Experiment comparison tabel of amplitude and phase values at 100 kHz. CIVA/Experiment comparison at 150 KHz. Left handside: Lissajous curve, right handside from the top to the bottom: real part, imaginary part, amplitude and phase. 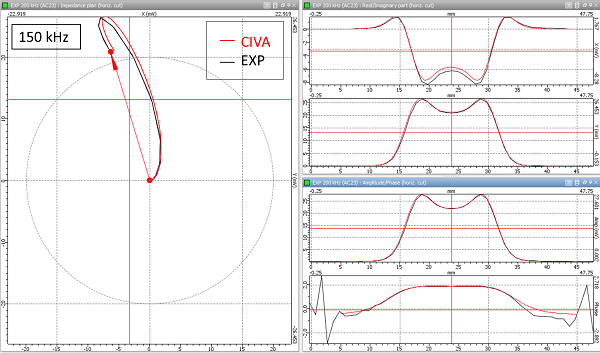 CIVA/Experiment comparison tabel of amplitude and phase values at 150 kHz. CIVA/Experiment comparison at 200 KHz. Left handside: Lissajous curve, right handside from the top to the bottom: real part, imaginary part, amplitude and phase. 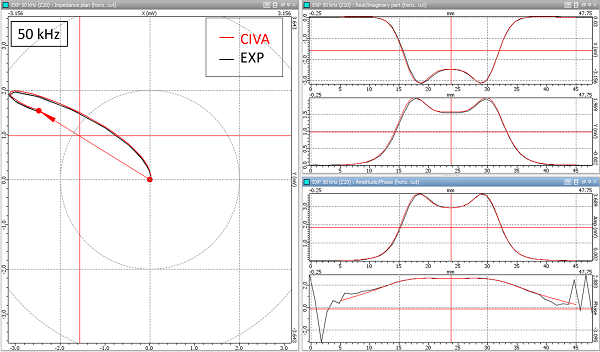 Finally, on two synthesis graphs are superimposed CIVA and acquistion curves. The first one shows the evolution of the amplitude as a function of the frequency, and the second one represents the evolution of the phase still as a function of the frequency. Amplitude evolution as a function of the frequency for CIVA and the experiment. Phase evolution as a function of the frequency for CIVA and the experiment. The good agreement between CIVA and the experiment is confirmed again by this graphs.